I have been booked solid with adoption profile designs so far this year so my blog has been woefully neglected… I am finally taking a break for a quick CONGRATS to the the 7 families that were placed with babies since January. 4 handsome boys and 3 precious baby girls! So happy for you all, hope to hear good news from more families soon! I am so excited to be working with TWO families next month on profile updates, I worked with both families in the past two years on their adoption profile for their first adoptions, they were both placed very quickly and are ready to add a new brother or sister. So excited to see what this year holds for all my clients! Finally, a HUGE welcome to my precious niece Eva, born to my beautiful baby sister and her husband. Congratulations Laura and Ryan, she is perfect! 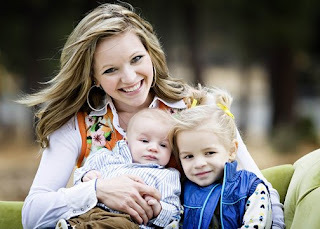 We have had a lot going on behind the scenes at Forever Family Designs… In October I have been faithfully working away at profiles, and have been notified by four families that hey have been matched or brought their babies home! Congratulations to all the new families! I was also able to get away for a few days to a photoshop conference which was a great experience both for inspiration and learning some great new tricks. 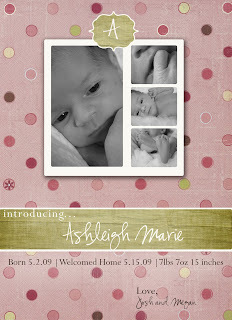 We have also brought on a new designer, Megan Caston and are excited to see all the new designs she is working on. Our super exciting news is that I have also been hard at work on a new website, and shoppe! While the website is not quite ready to go live yet we have our Shoppe up and ready to go for those of you waiting to place your Christmas Card orders. To celebrate the opening of The Shoppe, we will be offering 20% off of all of our Christmas Cards, Baby Announcements, and Custom Birth Mother gifts until the end of October. The coupon code for the savings is octsave09, hurry up and place your holiday order early and take advantage of the savings! You will find The Shoppe located at http://theshoppe.nextproof.com be sure to bookmark it! We are pleased to welcome Megan Caston to our design team! 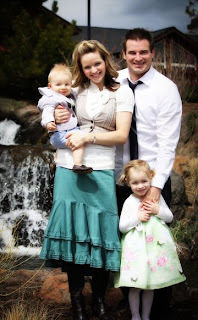 Megan and her husband, Jeff, are the parents of three beautiful girls. When not designing Announcement, Cards, and custom Birth Mother gifts, you will find Megan digital scrapbooking, sewing/crafting new projects, decorating her home and others, baking yummy treats or hosting a get together. Megan and Jeff are personally touched and blessed by adoption; they are very close with their nephew who came home through domestic adoption. Megan has a great eye for design, and we are very excited to have her join our team and look forward to the diversity she will bring with her design. 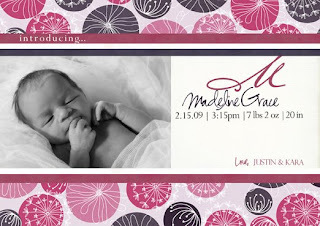 You can check out all of our announcements, cards, and custom birth mother gifts at our new Shoppe. We were contacted by Samuel’s mom to design a custom photo adoption announcement for him. They were leaving later that week to meet him in China and bring him home. We were happy to create a custom design that reflected his past and his future. Welcome home Samuel! 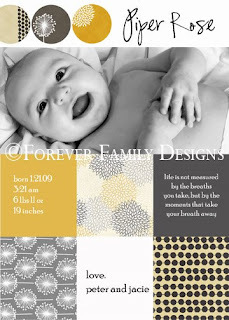 I am pleased to welcome my sister-in-law, Amber, to our design team at Forever Family Designs. Amber is a married to my brother, Loren, and is the Mother of 2 amazing kids. When not designing Announcements and Cards you will find Amber digital scrapbooking, sewing/crafting new projects, decorating her home, cooking a fabulous meal or hosting a get together. Amber has been blessed with an eye for detail and fashion, she does a great job putting colors and patterns together that most people would not think of which creates new and original designs. I am very excited to have Amber join our team and look forward to the diversity she will bring with her design. 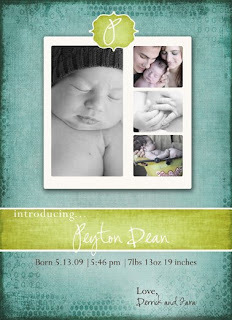 You can check out all of our announcements here: http://www.foreverfamilydesigns.com/html_ver/gallery.php?curr_page=1&gal_id=1&gal_type=&active_btn=4. 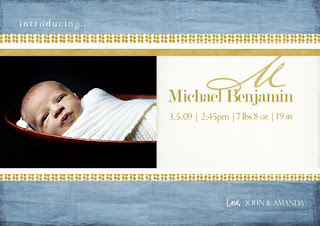 Our Nephew, Jude, was born about a month ago, and I got the privilge of designing his birth announcement. Thank you to Anna of Blink Photography for the amazing photos! Congratulations Amber and Loren, we can’t beleive how perfect he is!! !